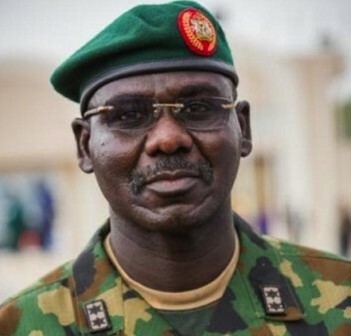 Nigeria’s Chief of Army Staff (COAS ), Major General Tukur Yusuf Buratai narrowly escaped on Saturday as his convoy was ambushed by suspected Boko Haram gunmen while going from Maiduguri to Dikwa, near the border with Cameroon. According to Colonel Sani usman, in a statement ,the leading convoy was ambushed by suspected Boko Haram terrorists at Faljari village between Mafa and Dikwa.However, the terrorists were over powered by the troops who killed 10 and captured five terrorists. “During the encounter, sadly, we lost a soldier, while an officer and four soldiers sustained gun shot wounds. The arrested terrorists have been sent for interrogation while the remains of the gallant soldier and the wounded soldiers were evacuated back to Maiduguri.